Okay, so occasionally the MG Mafiosi stray into YA territory, usually at the recommendation of some YA guru like Matt MacNish. For a while now, Matt has been trumpeting the praises of Andrew Smith and then, well, I heard Andrew's latest novel was about rugby and I knew I had to read it. Don't you agree that this novel has my name on it? I started it one morning and read all the way through in one sitting, it was that compelling. From the first scene, with Ryan Dean being held over a toilet by a pair of football playing thugs, the book has an air of menace to it. The menace continues throughout--the weather becomes a character, in typical dreary wintry Oregon fashion--and there are several violent episodes, including a knifing, which are harbingers of a tragedy to come. Yet it is also a very funny book, and a book about friendship. A lot of this has to do with Ryan Dean's energetic take on the world, and the cartoons he draws which frequently make it onto the novel's pages. What's more, Andrew Smith has a pitch-perfect ear for the teen voice--and several times I had to stop to pinch myself that this wasn't being written by an actual teenager. It is very true to boarding school life, with underage drinking, rivalries, and plenty of petty and not so petty cruelties. I won't spoil the ending, but I was not alone among readers (if Twitter is to be believed) in finding tears flowing down my face as I read it. My high-school junior read the front flap and wanted to read the book immediately. I would recommend it to high schoolers, with the knowledge that there are no punches pulled with the mature subject matter and the frequency of cuss words. As for me, I was thoroughly captivated by it, and will remember it for a long time. 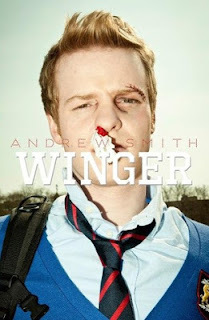 Thanks, Matt MacNish, for introducing me to Andrew Smith. I'm heading off to read his other novels now. I am fortunate to kickoff the blog tour for E.S. Farber's new middle grade series Fish Finelli. I have to say in passing that Chronicle Books is one of my very favorite publishing companies (they also are the publisher for Michaela McColl's novels, which I've raved about on this blog before.) Chronicle's books always have great production values, and it's evident that a lot of care has gone into their design. These books are good to hold. And read, of course! I read Fish Finelli in one sitting, and I'm sure my boys, who are nearly seven and ten would love it too. It's a terrific "boy" book without all that tiresome flatulence and booger jokes. Although there is a scene with goose poop which, as Fish says, "seriously puts the N in Nasty." What it's About: (From the Chronicle Books catalog)--When bully Bryce Billings bets Fish Finelli that he can’t find Captain Kidd’s legendary long-lost treasure, Fish and his friends embark on a quest to find real-life pirate treasure. Between sneaking into the library to track down Captain Kidd’s map, stowing away on a boat, and trespassing on an island, Fish and his friends have their work cut out for them. But will Fish actually be able to find Captain Kidd’s booty and win the bet? Opening Lines: "It all started the morning I broke into my lobster piggy bank. I had chosen a basin wrench for the job. It's a good tool for a delicate operation. I know this because my dad is a plumber and taught me lots of stuff about tools." The humor -- The corny jokes are exactly how boys of this age interact. Here's an example from page 82. "You can say that again," said T.J., grinning. T.J. threw a malt ball at him. The adventure -- There's stowing away on boats, trespassing for pirate treasure, and spying on potentially villainous librarians (sorry, librarians!). And the pace moves fast. The illustrations -- These are the work of Jason Beene. Every few pages there is a fun, one-page pictorial spread. The cartoony look fits the narrative to a tee. The sidebars, packed full of tidbits of information -- As previously mentioned, Fish is a bit of a walking encyclopedia. E.S. Farber has added a number of sidebars to expand information on historical characters mentioned in the narrative (Captain Kidd, Nikola Tesla and Marco Polo), animals (lions and ospreys), and history (the origin of the white flag of surrender, as well as the history of the microwave oven). Cool stuff. ABOUT THE AUTHOR: E.S. Farber is the mother of a boy who likes facts along with his fiction, which inspired her to write Fish Finelli. She has authored numerous books for children. She lives in Amagansett, New York. And here is a Chapter Excerpt and a discussion guide for teachers and librarians. Thanks for stopping by today. Leave a comment, and you will be entered into a drawing for a giveaway of a copy of Fish Finelli: Seagulls Don't Eat Pickles. Happy Reading! Pals, I have a post over at Project Mayhem today, entitled :How Do You Get Someone to Read Your Book?" Do pop on over if you have a moment. And, if you haven't yet done so, check out our fantastic 700 Follower giveaway. Agent phone calls, critiques, and ARCs aplenty! !